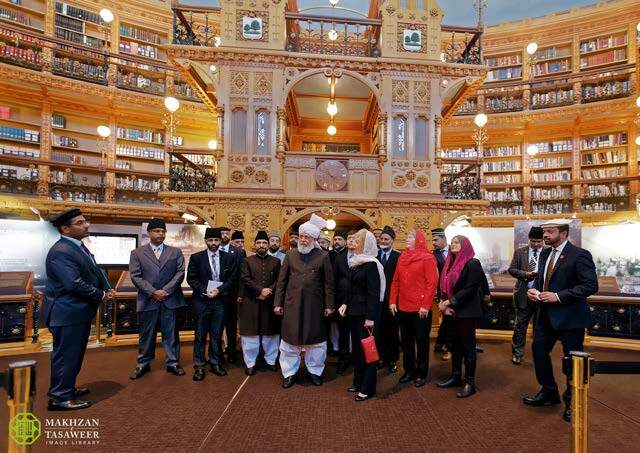 On 17 October 2016, the World Head of the Ahmadiyya Muslim Community, the Fifth Khalifa (Caliph), His Holiness, Hazrat Mirza Masroor Ahmad was welcomed to Canada’s Houses of Parliament by Prime Minister, Rt Hon. Justin Trudeau, Cabinet Ministers and over 50 MPs and Senators. to an audience of more than 225 people at a special reception held at the Sir John A. Macdonald Building at the Canadian Parliament in Ottawa. More than 110 guests attended, including over 50 Members of Parliament. The event was also attended by a number of Government Ministers including Hon. Kirsty Duncan, Minister of Science and the official representative of the Prime Minister and Hon. John McCallum, Minister for Integration, Refugees and Citizenship. Also in attendance were Senators, Members of the Diplomatic Corps, including 11 Ambassadors of State, media representatives, academics, NGO leaders, religious leaders and prominent figures from various other sectors of society. 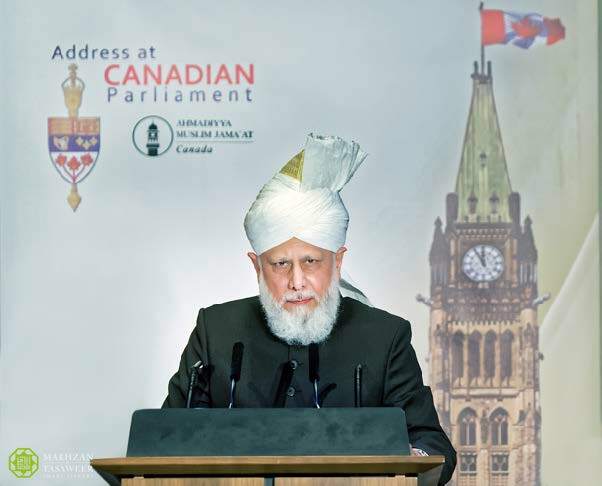 During his keynote address, Hazrat Mirza Masroor Ahmad addressed various issues of global importance, including the risk of a global war, religious freedom, increasing radicalisation and extremism and international relations. His Holiness called on the world’s governments to display true justice and equity in all matters. His Holiness also presented Islamic teachings and offered solutions to the world’s problems based on the teachings of the Holy Quran. His Holiness admitted that fear of Islam was growing in much of the world. However, he said that fear of the religion itself was completely unnecessary. His Holiness said that universal religious freedom was a pre-requisite for any successful and tolerant society. His Holiness said it was a cause of regret that governments in the Muslim world and also some Western Governments had sought to restrict the religious rights of some communities within their nations. His Holiness said that any attempt to curb religious freedom was dangerous. His Holiness said that though religious freedom was a principle of vital importance, wherever there was a risk of extremism or incitement to hatred, it was the task of Governments to intervene and take firm action in order to protect their people. His Holiness also spoke of the need for justice both in domestic affairs and international relations. “without considering the potential consequences”. He said such weapons often end up in the wrong hands or are used in order to kill innocent civilians. His Holiness also said that international institutions such as the United Nations needed to ensure fairness and equity between members states. 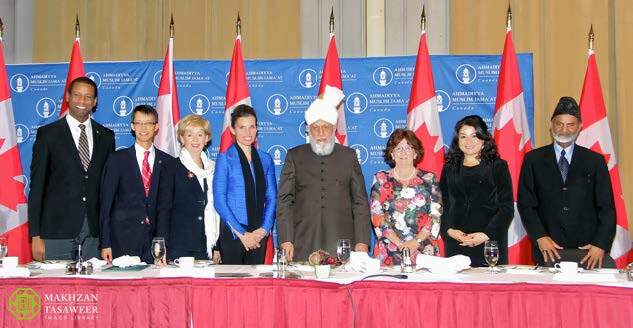 During the event, His Holiness, Hazrat Mirza Masroor Ahmad presented Hon. Louise Arbour, the former High Commissioner for Human Rights at the United Nations and a former Canadian Supreme Court Judge with the Sir Zafrullah Khan Award for Public Service. This award recognised her outstanding public service during her long and distinguished career. A number of guest speakers also took to the stage. Earlier in the day, His Holiness held a range of meetings with Federal Ministers of Canada’s Government, Senators and MPs. His Holiness also held a meeting with Prime Minister Rt. Hon. Justin Trudeau. 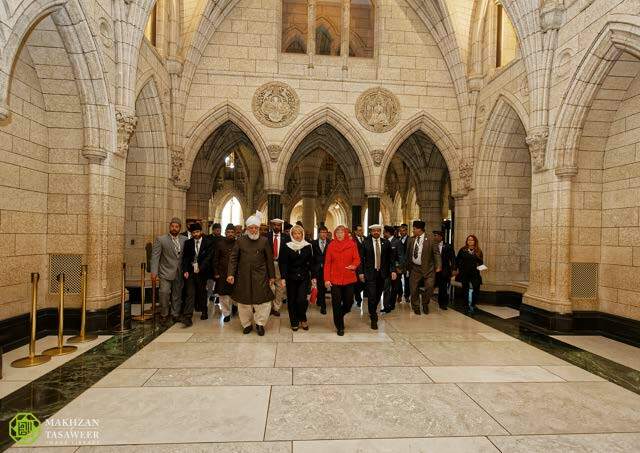 The Head of the Ahmadiyya Muslim Community was also officially recognised by the Speaker of Parliament during a session of Question Period, in which all present members of the House of Commons, including the Prime Minister, stood and gave His Holiness a standing ovation. “Mr. 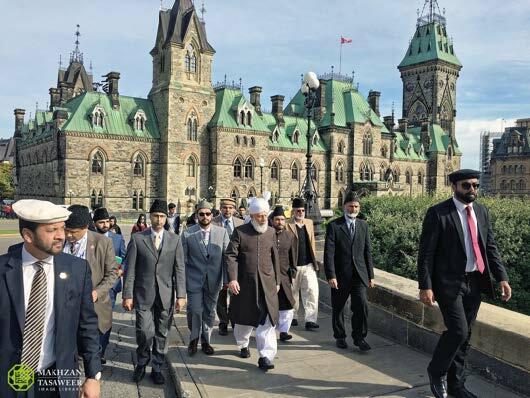 Speaker, earlier today the global spiritual leader of the Ahmadiyya Muslim Community arrived in Ottawa for a formal visit to Parliament Hill. During his time with us, he will meet with Cabinet Ministers, Senators, Members of Parliament, and the Prime Minister in an effort to further underscore his peaceful message of love for all and hatred for none. 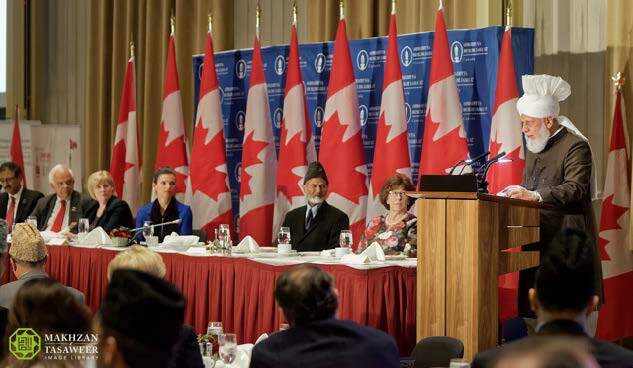 This work is part of an ongoing effort undertaken by His Holiness to showcase the peaceful nature and beauty of the faith (of Islam) and while calling on global powers to advance an agenda of peace, religious freedom, and the advancement of human rights in Canada and around the world. 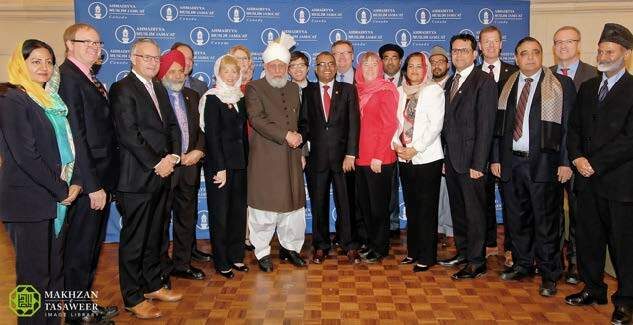 The special reception concluded with a silent prayer led by Hazrat Mirza Masroor Ahmad. Following dinner Parliamentarians and guests were able to meet personally with His Holiness.